Arriving into town at 8AM after a flight from New York, my mum and I weren’t exactly wide eyed and bushy tailed (especially since I couldn’t sleep because I kept watching Marie Antoinette. Those visuals!) So when we checked into the Front Hotel in Nyhaven (a once bad area that is now trendy and charming) we weren’t sure if we should sleep or go out. We chose to go out. Walking outside for awhile the cold weather got to us and slowly my brain started to fade; I found it hard to remember where things were and it was too early to go into shops. What were a couple of tourist girls to do? Hop on a warm little tour bus for a few hours and have someone else tell us what things were and where to go. Normally I’m not a fan of the tour bus but the two and a half tour (which runs at 11AM outside of the Town Hall) is something I’d highly recommend; especially if the stylish Finnish women in a red coat is giving the tour. The (very comfortable)bus takes you all over the city, allowing for only a few stops. This, I think, works well as it helps you to learn the city and then decide where you’d like to go and spend time later on. For me, I discovered at the end of the tour I really needed to see my bed as I had dozed off and missed the last part. Walking back to the hotel we window shopped, remembering which places we’d would return to tomorrow. When we arrived back at the hotel my stomach needed something and so, to the lobby I went. It was Valentines Day – not something ordinarily celebrated here but it is slowly, but surely, coming into fashion. The restaurant had red, pink and purple gothic style wine glasses on all the tables alongside flowers in the same hue. It was an interesting mix of old with modern decor; something that is very Danish. After a light meal we returned to the room, washed up and was out at 5PM. Waking up at midnight for a snack before returning to sleep until 9AM the next morning. After a busy few days in Los Angeles, New York and Copenhagen, the luxurious bed with the fluffiest of duvets was a much-needed thing indeed. 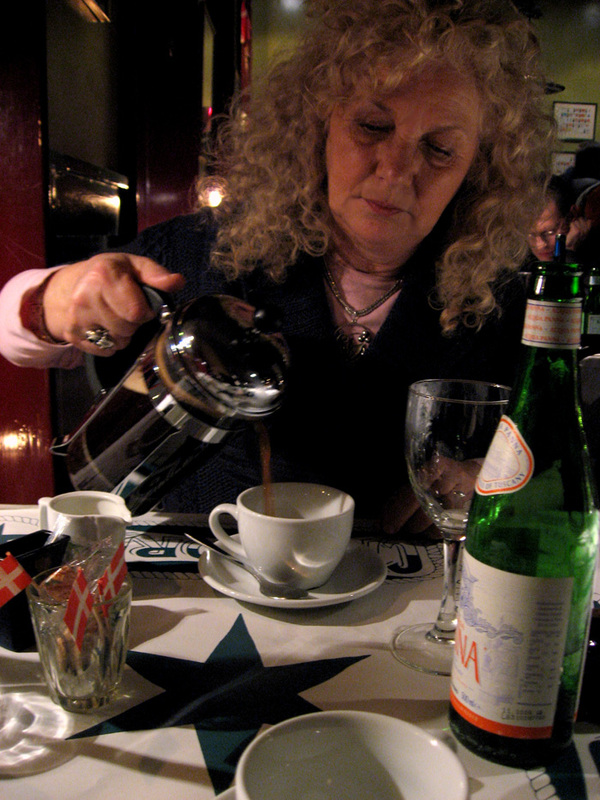 My mum celebrating her birthday in Copenhagen as a Dane would – with coffee at 10PM! Then, today I asked my mother what she’d like to do for her birthday. Her reply? Shop! She’d never really shopped Copenhagen before and so we headed over to Strøget and Købmagergade; the famous walking streets. 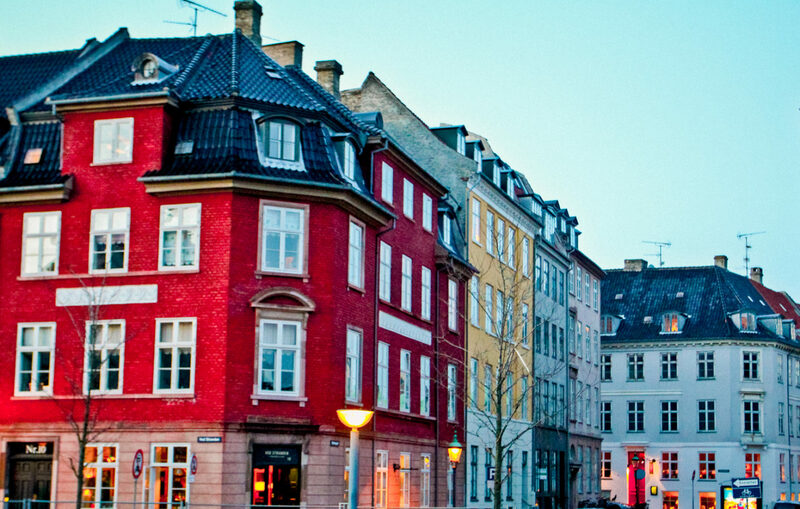 Some areas are nicer than others (try starting in Nyhavn) but it’s worth it to walk it all. I’m not much for shopping (I secretly love to window shop at night when the lights are on so you can see everything) but it was good to have a place to dash into when the weather outside was a bit too nippy. Although, I must confess to being very happy about the Bodum Store where I snagged a little milk frother (which can go on a gas stove) and a tea pot that had a tea-light candle warmer underneath! And I was also happy to find that I could get a discount at the Urban Outfitters Europe store for a top that I fell for and as well as scoring a beautiful $60 coat at the H&M! I also swooned over a couple of pieces at very Danish stores, Georg Jensen (Gee-ree-ehn-son) and Royal Copenhagen but decided to think about them and, if at the end of the trip they’re still in my mind, I’ll pick them up then. When dinner came, it was time to celebrate my mothers birthday and since Cap Horn had been recommended to us by several people, we decided to give this “global organic kitchen” a try. What might have seemed like a little unassuming restaurant/pub was a culinary experience; fresh, organic foods bought from local markets were cooked to perfection. Not being able to eat gluten due to a food allergy, they knew how to accommodate me (this has been the norm thus far in Denmark whereas in America it’s very hard to eat out with a gluten sensitivity). And, like France, the restaurants here expect no turnover; when you take a table it is yours for that night (or, in our case, 2.5hrs!). When the meal and coffee were done, it was time to head home to the hotel where we got up on the days photos, emails and dish from home. Ah, Copenhagen!